Help monitor the US midterm elections, and keep polling locations accountable to the voters. The PollWatch browser app helps you to report problems at your polling location. All the reports will appear on a national map and, if verified, will appear on NBC News. Yesterday, judges in New York state were hearing calls for hand recount, while elsewhere other vote counts were being factored into the totals, and on the other side of the Atlantic, the same question “where are the election results?” was getting very serious. In the Ivory Coast, like in some places in the U.S., there is a very close election that still isn’t decided. There, it’s gotten serious, as the military closed off all points of entry into the country as a security measure related to unrest about the close election and lack of a winner. Such distrust and unrest, we are lucky to have avoided here; despite the relatively low levels of trust in U.S. electoral processes (less than half of eligible people vote, and of voters polled in years past a third to a half were negative or neutral), we are content to let courts and the election finalization process wind on for weeks. OK, so maybe not content, maybe extremely irate and litigious in some cases, but not burning cars in streets. That’s why I think it is particularly important that Americans better understand the election finalization process — which of course like almost everything in U.S. elections varies by state or even locality. But the news from Queens NY (New York Times, “A Month After Elections, 200,000 Votes Found”) though it sounds awful in headline, is actually enormously instructive — especially about our hunger for instant results. The unofficial election night returns reported by the press always have huge discrepancies — which is why neither the candidates or the election officials ever rely on them. That’s particularly true as NY has moved to paper optical scan voting from lever machines, and the finalization process has changed. But in the old days, it was possible to misplace one or a few lever machine’s worth of vote totals with human errors in the paper process of reading dials, writing numbers on reporting form sheets, transporting the sheets, etc. Then, add to that the computer factor for human error, and you get your 80,000 vote variance in Queens. Bottom line — when an election is close, of course we want the accurate answer, and getting it right takes time. Using computerized voting systems certainly helps with getting quicker answers for contests that aren’t close and won’t change in the final count. And certainly they can help by enabling audits and recounts that lever machines could not. But for close calls, it’s back to elbow grease and getting out the i-dotters and t-crossers — and being thankful for their efforts. Last time, I wrote about what I learned from two curious statements in the context of the NC experience with and litigation about flakey voting machines. Today is Part Two, starting by explaining what I mean by “flakey”, and finishing with a response to Johnnie McLean’s (NC SBE deputy director) statement at the conclusion of the litigation. When I say “flakey voting machine” I simply mean that the machine in question is prone to mis-behavior that leaves the voter with low confidence that their votes were recorded correctly. 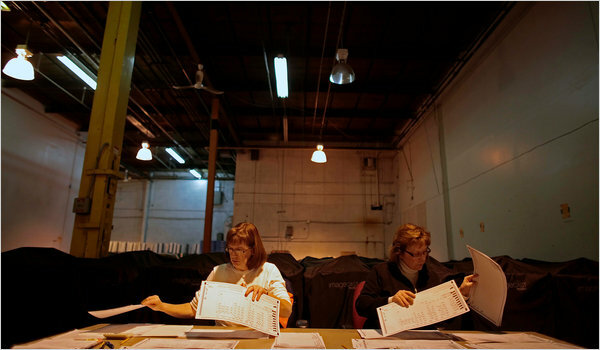 Examples from this election include both touch-screen misbehavior and opscan machines accepting one sheet of a two-sheet ballot and rejecting the other sheet. What do I mean by “prone to”? Just that mis-behavior has frequently been alleged, even if some allegations proved unfounded. When I see a voting machine behaving in a way that I see as strange, it’s just a fact that I’m not going the confident about the outcome, even if someone explains that the voting machine is just fine and the behavior was my problem. I hope this is the end of the issue. We have every confidence in the voting systems North Carolina has and I’ve seen no evidence that we should feel differently. That’s sensible at one level, but completely misses the point at another level. Ms. McLean is being sensible when she points out that there were no cases of a voting machine mal-functioning by mis-counting votes, and that most of the incidents were from machine mis-behavior caused by user error. And yes, the mis-behavior was caused in part by people touching the screen in multiple places, so you could say that it was the “voter’s fault.” Technically, it might be true to say that these machines were operating “according to spec” which includes: if you calibrate them tightly and a user touches a screen in exactly the wrong way, the user will see some weird stuff that is not what they meant. But that is missing the point. Even when these devices are operating “correctly”, they can easily mis-behave. From the perspective of a voting machine vendor, these devices are operating “correctly” when they get confused by a voter doing multiple simultaneous moving touches. It’s not that the voting systems are inherently un-reliable in counting votes (or at least no less unreliable than software in general). Rather, these particular NC systems are inherently flakey. They just weren’t designed for or built with technology that supports very-low-error operation by ordinary people in the wide variety of typical circumstances. Of course not! This is not your typical iPad — but rather 20 year old screen technology in some cases. This is not your typical iPhone running an award-winning iPhone app, developed with sophisticated usability testing — but rather a somewhat hastily-assembled system created about 8 years ago to cheaply and quickly get to market to be the first to soak up HAVA funding. Of course, NC voters deserve better than these current systems. And NC taxpayers deserve better+cheaper than the perhaps-a-bit-better but quite expensive replacements that vendors offer, but many election officials literally can’t afford. It’s just that in the US voting systems market today, you just can’t get what you deserve, never mind how important high-confidence elections are.